If that Sunday morning you had told me that come late afternoon I would be walking round the muddy Venetian fields beating an old rusty pan with a metal rod, I would have laughed at you. Yet, there I was, surrounded by a thick crowd of adults and kids. With an odd assortment of pots, lids, tambourines and even a huge wind chime in our hands, we were making as much noise as possible. A ruckus, really! Our aim was to drive winter away and welcome spring. Perfectly in line with the traditions of the old Veneti – an Indo-European tribe which used to populate the lands of the Northern Italian region of the Veneto as far back as the 8th century BC. The Veneti knew how to cultivate the land, make wine, breed animals, work metal and ceramics, produce art and jewellery. They had their own writing system and, curiously enough, their name ‘Veneti’ was derived from the Proto Indo-European root ‘wen-‘ meaning ‘to strive, to wish for, to love’. Etymologically, the Latin word ‘venus (veneris)’ for ‘love, passion, grace’ comes from the same root. The Veneti also used the ancient Indo-European calendar according to which the year had only ten months* and started in March with the re-birth of earth after the long winter. This was perfectly in line with the agricultural needs of the land they tended to, a circle which closed with the cold season and began again with the first rays of the sun. The Julian Calendar took effect on 1st January 45 BC. It was a reform of the Roman calendar and among many things, established 1st January as the first day of the New Year. This was in line with the Consular New Year (the day on which the new consuls took office in Rome) which had been starting on 1st January since 153 BC. In 1582 the Gregorian calendar was introduced, firmly establishing 1st January as the beginning of the New Year. Later on and in order to simplify their calculations, the Venetians moved their New Year celebrations to the 1st March. Funnily enough, once the Gregorian calendar was introduced, the Venetians kept their own calendar but started adding ‘m.v.’ to all references of dates. The acronym meant ‘more veneto‘ – Latin for ‘the Venetian way’ or ‘according to the Venetian use’. This continued all the way to 1797 when the Republic fell in the hands of Napoleon. And in just over two centuries, the tradition of the Venetian New Year was more or less forgotten. 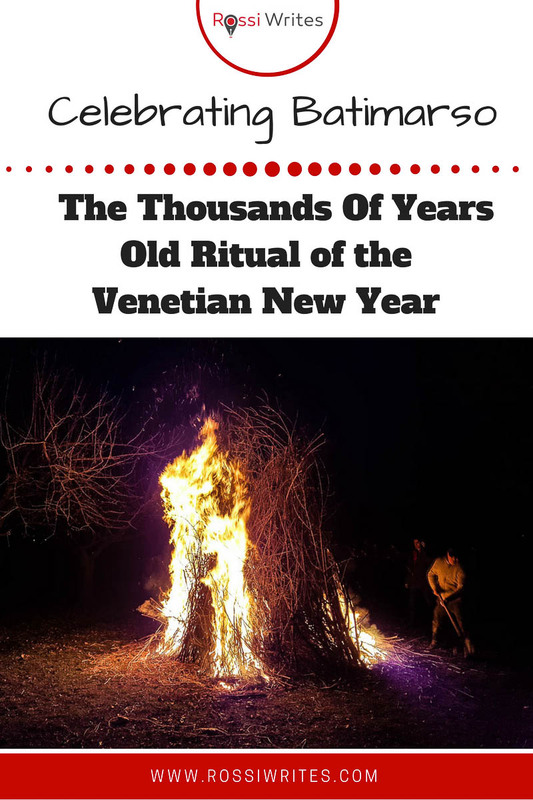 Until several decades ago when the people of the Veneto started to revive their old customs and rituals. One of them was Batimarso (also called ‘Batter(e) Marzo’, ‘Brusar Marzo’, ‘Ciamar Marzo’ and ‘Ciamatta di Marzo’). Its aim was to drive winter away, to call spring in and to awaken the earth to a new cycle of rebirth and growth. In other words, to call Mars – the ancient god who gave his name to the month of March and who, originally, was the god of nature and fertility, of thunder and rain and only later, in the Classical age, became the god of war. Celebrated during the last three days of February (the shortest month of the year as it was initially its last) and the first nine days of March, Batimarso is the traditional expression of the old Venetian New Year or Capodanno Veneto (also Cao de’ Ano) as they call it locally. Nowadays, there are large celebrations of Batimarso in several towns of the Veneto like Recoaro Terme and Asiago. Nothing like the call of a thousands of years old ritual to wake up our primitive soul – the one that we all have and the one we all have quite successfully buried under deep layers of modern technology and even more modern cynicism. Thus, when on the first Sunday of March I spotted an invitation (in the Facebook Events’ section of all places!) 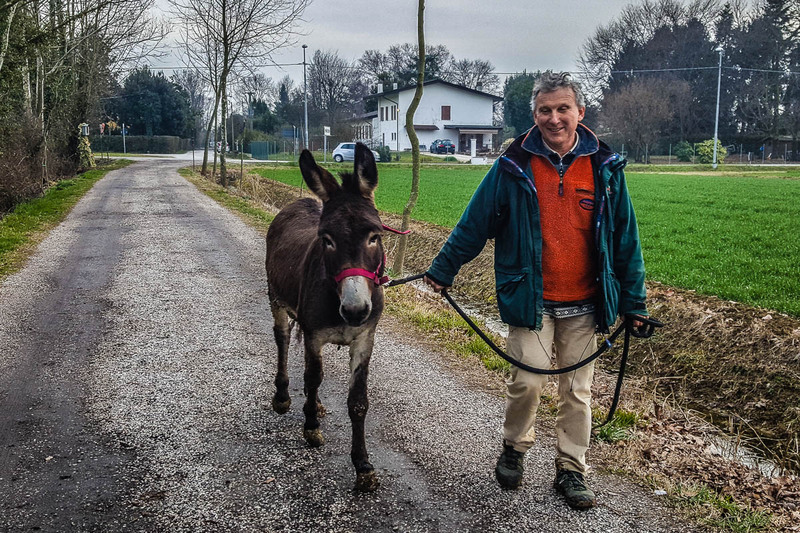 to celebrate a Capodanno Veneto in a farm just outside Marcon in the province of Venice, my own primitive soul awakened. I felt like I really, really wanted to go there and see it for myself. Even though until that very moment I was busy telling my husband that I would quite happily just stay at home and take it easy working on my blog or something. Yet, the second I clapped my eyes on the words Capodanno Veneto my curiosity was picked. I felt intrigued. The organisers promised a spring-awakening ritual Batimarso combined with a bonfire and homemade food. 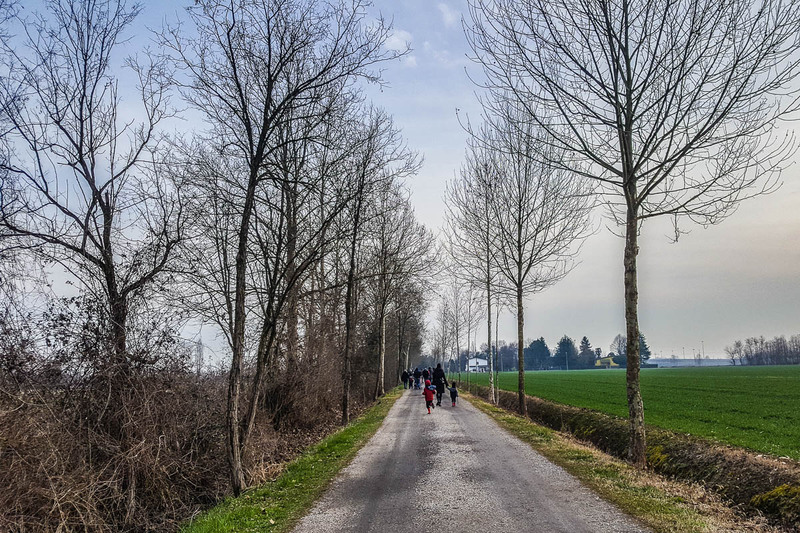 So, before you know it, we were piled in our white car and travelling past Padua and Mestre all the way to Il Rosmarino farm on the outskirts of Marcon. 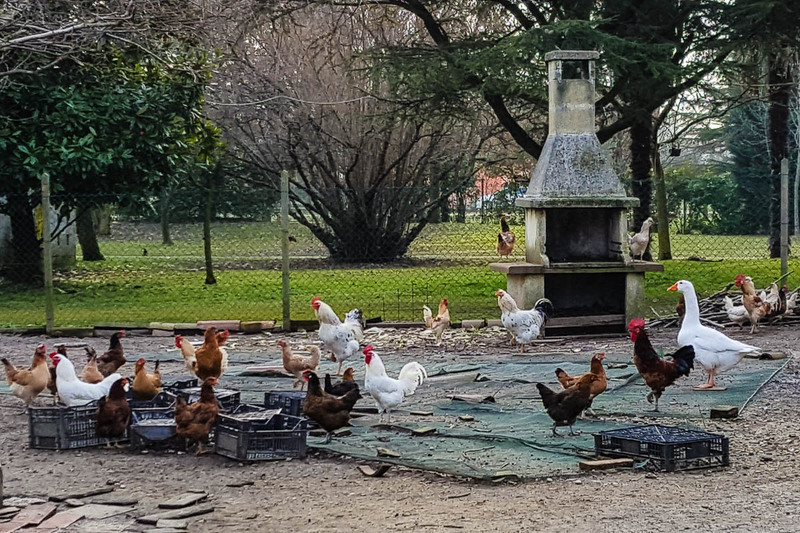 Il Rosmarino turned out to be a rather nice place with a huge barn, dozens of horses, donkeys and a multitude of hens, roosters and ducks which were busy chasing each other in the mud. Dozens of adults and kids were already milling about. 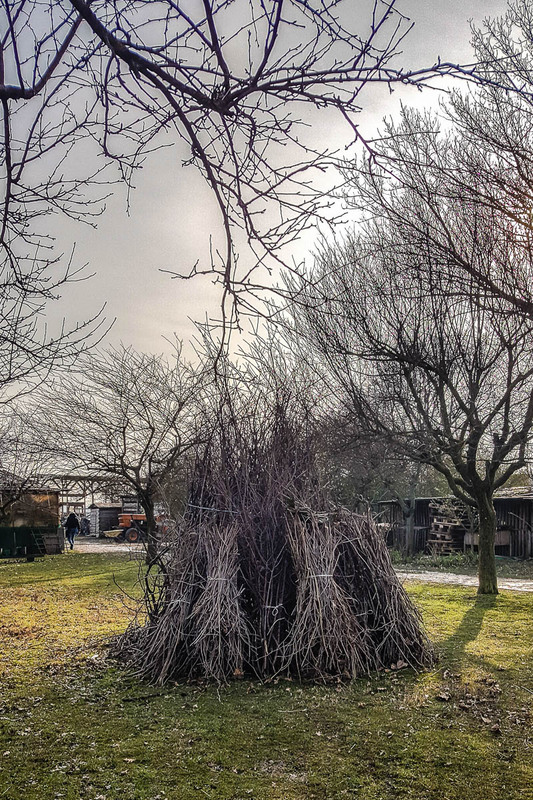 The huge bonfire was stacked waiting for the night to fall. And a panpiper was providing the musical accompaniment to this lovely rustic idyll. 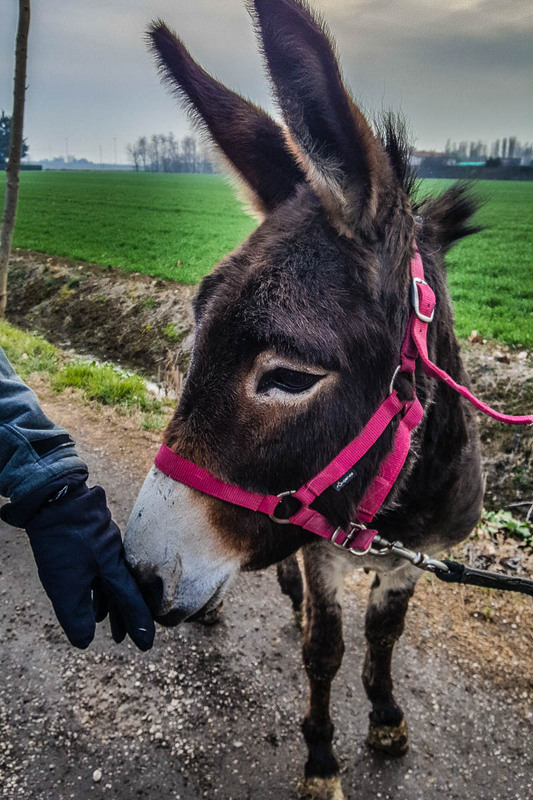 We petted the donkeys, fed some hay to the horses, observed the hens and the roosters at their spring games and generally just hung around for a while trying to fathom what was about to happen. As the invitation had stated – we had brought with us things suitable to make noise. Hence, we were holding a plastic monkey-shaped tambourine and a wooden whistle while people around us had come prepared with metal pots and lids, and even the aforementioned huge wind chime. After a few more minutes of waiting, someone brought out a big bag filled with old rusty pans and metal rods which children and adults alike quickly grabbed and started happily bashing. To be honest and this is to show how totally inexperienced I am in thousands of years old rituals, I had sort of imagined that we would form a circle or something and that the children will be clapping their noisy toys in the middle for a few minutes and then we would go to eat. Instead, our large and noisy group of people headed on a long walk through the fields. A man dressed as Harlequin was at the head of the crowd, making jokes, jumping around, and providing a great entertainment for all the kids. 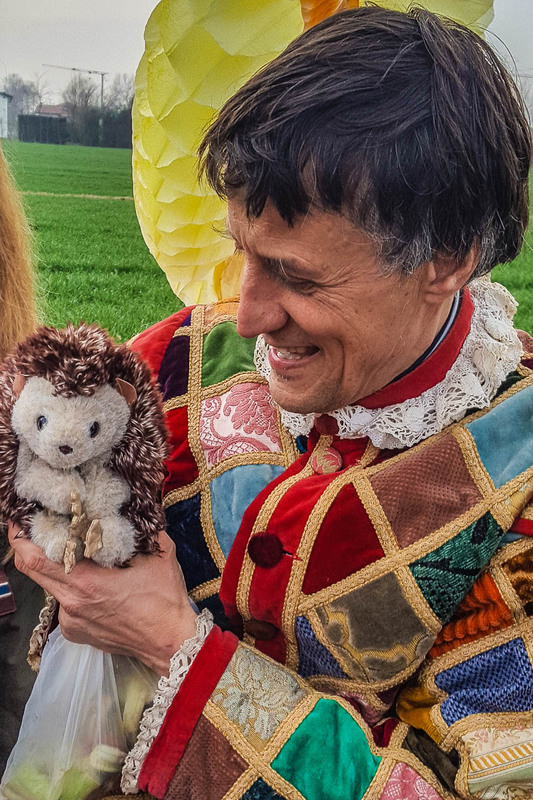 At one point our Harlequin even improvised a theatrical performance with puppets that he brought out of the large and heavy old-fashioned travelling box that he lugged around with us on the walk. The kids loved it all! All the while our large group of people didn’t stop making noise. The fields, wet and muddy from the recent snowfall, stretched in front of our eyes. The sun above us shone brighter than before. The moist air was starting to smell of spring. That pungent smell of fresh earth and green leaves. It must be said that there is something very therapeutic in making noise. With wild abandon I was, first, shaking my monkey-shaped tambourine and, then, beating one of the rusty pans with a metal rod. I could almost feel how the dissonant sounds that adults and kids were producing were pushing winter away, scaring her off, and breaking her cold grip on the frozen earth. In my mind, I made a little tune which I repeated a few times in the rhythm of my tambourine which was going at odds with the many different rhythms everyone was following for themselves. I remembered the one time when I went to a meditation yoga class under the accompaniment of cymbals, bells and drums. Being forever shy of strenuous physical exercise, I decided to go as I was assured that we would simply lay on the floor and relax for an hour in a comfortable position while listening to some improvised music. It sounded good. Before the class started one of the two yoga teachers who led it gave a little talk about the power of sound. He told us stories about people using bells to combat diseases and terrifying noises to win in battles. He spoke about sounds rearranging cellular memories and other such things. It all sounded a bit new-age-y, to be honest with you. You could take it or leave it. And my initial reaction was definitely the latter. I remember that at the start of that yoga class I had a terrible headache – the product of having spent the day walking around in the bright sun. So I was quite looking forward to just laying on my borrowed yoga mat and switching off. After the talk, the two yoga teachers performed an ever changing and every so often dissonant array of sounds. They used a collection of bells in many different sizes, drums large and small, a huge gong and even a water bowl. I could feel the vibrations of the sounds pulsating first through my achy head and then through my arms and through my legs and though my whole body. I didn’t achieve a divine enlightenment or any such thing, but by the end of it all my headache, that had tortured me relentlessly for the whole day, was almost gone. Since then, I have noticed how much I enjoy it when the bells of Italian churches start their song several times a day. I especially love hearing them just as the night falls in and we, as a family, sit around the table enjoying our dinner and some precious together-time. There is something very wholesome, very satisfying to hear the bells just then. So, yes, here we were in the middle of the muddy Venetian fields, making noise to the heavens above. Were we scaring the winter away?! Was there something about noise and its power to bring change to the physical world that the old Veneti knew better than our modern selves? I don’t know. I can only tell you that I enjoyed it a lot. Once we reached the end of the field, the donkey Indi was waiting for us. Delighted, the children gave him lots of pets. 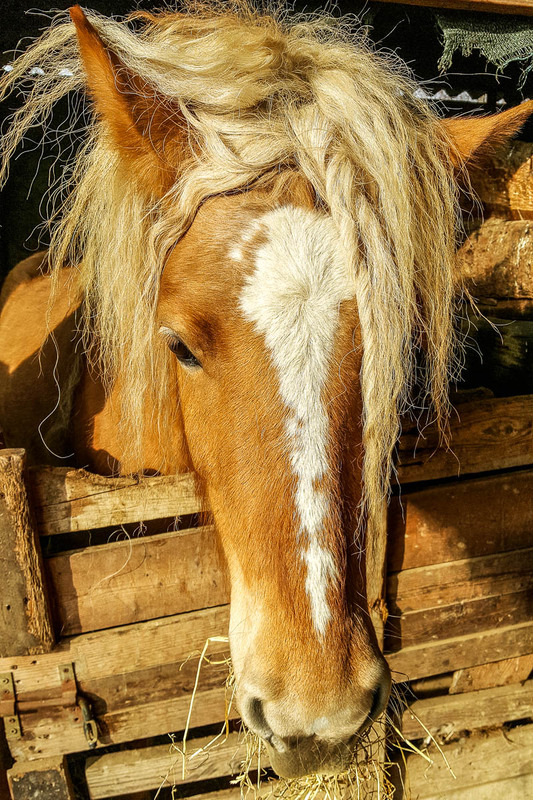 Then, we turned round and, making even more noise and in an even more rambunctious mood we headed back to the barn of the farm. There a small feast had been laid out for us. Chunks of homemade cheese and homemade olive oil generously drizzled over slices of homemade bread were the stars of the show for me. The olive oil was so fragrant and nuanced that eating it together with the bread and the cheese it felt like I was having the best meal of all times. It was all combined with lots of chatting, milling around and, yet, making more noise with our loud voices and happy laughter. Evening dusk had fallen by the time the plates were polished to the last crumb of bread and the last drop of oil. 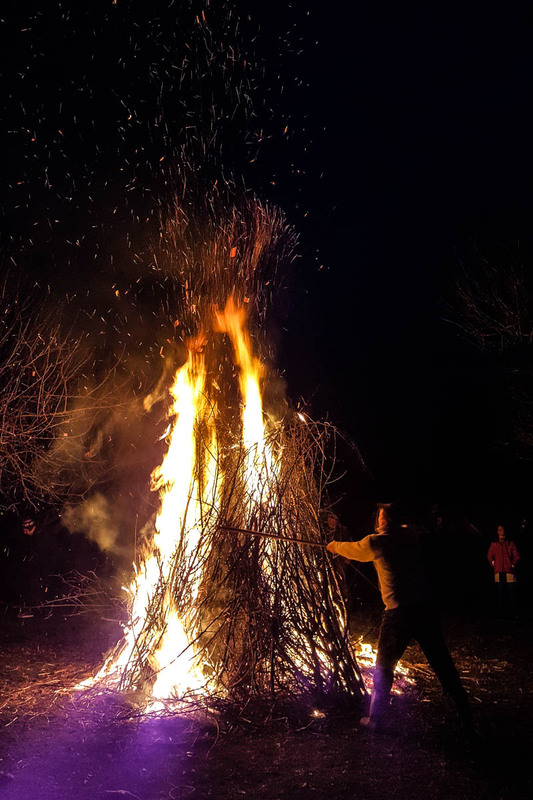 And while the children ran and played games in the spacious attic above the huge barn, the adults headed outside to watch the bonfire under the sounds of the panpipe. The long flames licked the dry sticks. Thousands of sparks flew up in the night sky and then they rained down as grey ash on the ground. We were burning the old and welcoming the new. Happy Venetian New Year to all of you! * Originally, the year had ten months: Martius, Aprilis, Maius, Iunius, Quintilis (later Iulius in honour of Julius Caesar), Sextilis (later Augustus in honour of Augustus Caesar), September, October, November, December. Hence the names of several of the months don’t correspond to their current place in the calendar. For example, ‘December’ meant ‘the tenth month’ whereas nowadays ‘December’ is the last, twelfth month of the year. January and February were added much later and were initially the last months of the year.